Prof. Godfrey Mbiti Nguru is the new Chairman of The Technical University of Kenya Council. He takes over from the late Prof. George Eshiwani who passed on earlier this year. Prof. Nguru is an accomplished educationist and an Ordained Priest in the Anglican Church of Kenya (ACK) who has held senior positions in premier public and private universities. 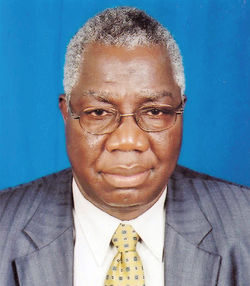 Prof. Nguru’s decorated career spans over 40 years. He served as Vice-Chancellor at Daystar University between 2004 and 2010 and served in the same capacity at Pan Africa Christian University between 2010 and 2014. He was also St Paul’s United Theological College Principal (currently St Paul’s University) between 1999 and 2004. He began his career as a secondary school teacher in Mbeere District and later joined the Ministry of Education as an Education Officer – Planning. After a Specialist Course in Educational Planning at the International Institute for Educational Planning (IIEP) – Paris, France, he was appointed the Educational Planner for the Ministry of Education. In 1975, he was appointed Senior Lecturer and Head of Basic Research and Evaluation at the Kenya Institute of Curriculum Development before proceeding to the University of Nairobi where he was appointed Lecturer at the Department of Education Administration, Planning and Curriculum Development, within the Faculty of Education which was later transferred Kenyatta University College in 1978. Prof. Nguru held various positions at Kenyatta University where he served as a Senior Lecturer and a coordinator in the Environmental Education programme. In 1983, he had a short stint as a visiting scholar at the Institute of Education, University of London. He has attended and participated in several national and international conferences. He has authored a number of books, articles, and research papers on a wide spectrum of areas concerning Education and HIV/AIDS in Africa. Prof. Nguru was awarded the African Graduate Fellowship (1971), UNESCO/UNDP Fellowship (1974), Aggrey Education Fellowship (1977) and the British Council Committee for International Cooperation in Higher Education (CHICHE) Award (1983). Prof Nguru is also committed to community service. He is a member of the Council of St Andrews College of Theology and Development, Kabare, Kirinyaga. Previously he served as Chair at the African Theological Initiative, Living Water International (Kenya), Board of Education, Anglican Church of Kenya - Mbeere Diocese, Higher Education Loans Board (HELB), among others. Prof. Nguru holds Bachelor of Education from Makerere University, Master of Science in Education (Education Administration and Planning as well as Curriculum Planning and Development), Ed.S and Ed.D from the University of Tennessee Knoxville, USA. In 2006 he was awarded an Honorary Ph.D by Kosin University in South Korea.